Once on the brink of extinction, Canada’s National Horse is still rare, but more people are discovering just how versatile “le petit cheval Canadien” really is. Canadian Horses have been used for centuries for farming, logging, pulling carriages and sleighs, racing, riding and even as ranch horses in Canada’s west. But the breed nearly died out after World War II, and even today there are still people who have never heard of Canada’s equine treasure, its origins in the stables of a king, and its contribution to many of the horse breeds of North America. Beaulac de Cap Rouge, a Canadian Horse stallion. The breed began on July 16, 1665, when two stallions and twelve mares chosen from the finest horses in the stable of King Louis XIV of France arrived in New France (southern Quebec). These horses included mostly Barbs, Arabs, Turks and Spanish horses. Only the best were sent. Additional horses arrived every year between 1667 and 1671, for a grand total of eighty-one horses. These horses had to do everything from hauling logs to ploughing fields to pulling carriages and serving as riding horses. They were raced in harness and under saddle. With no other horses in New France, these royal horses were interbred for the next 150 years. The selected mix of types in the original shipments ensured genetic diversity, and hard work and harsh winters eliminated the weakest and reduced the size. By the late 1700s, Canadian Horses were well established. They were 14 to 15 hands, weighed about 900 to 1,100 pounds, had thick, wavy manes and tails and lightly feathered fetlocks. Their heads were refined with tiny curved ears, large dark eyes, wide foreheads and slightly dished profiles, while their bodies were well muscled. They had very strong bone, hard hoofs and could thrive even on poor forage. 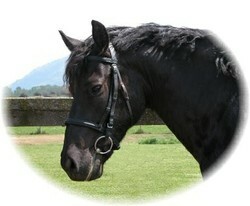 They came in every colour except pinto or Appaloosa, but most were dark, with many being black, brown and bay. Most had minimal white markings. These Canadians were tough. They would work hard and stay in great condition even under poor conditions. Their strength was astonishing, with many out-pulling much larger teammates, hence the nickname Little Iron Horse. They were smart and spirited, but gentle and sensible. It wasn’t long before the little horses had spread west to Alberta and as far south as the Caribbean. 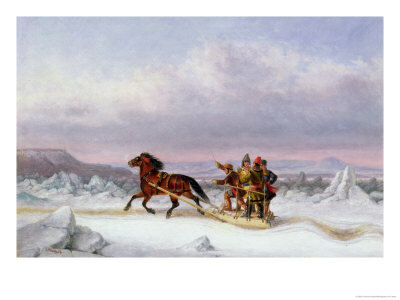 As early as 1820, there were classes for Canadian Horses at agricultural shows in Quebec and in New York state, and by the middle of the century they were being immortalized in paintings by Cornelius Kreighoff (1815-1872). Canadians had great endurance and were fast at the trot and pace. Several became renowned race horses. Three Canadian stallions named Copper Bottom, Old Pilot and Tom Hall were bought by Americans and became the ancestors of many of today’s pacing Standardbreds, according to the United States Trotting Association. Even today, some Canadians are natural pacers. If you think this Little Iron Horse sounds a lot like a Morgan, you’re right. There are numerous Canadian Horse mares in early Morgan pedigrees. Some people believe the foundation stallion, Figure, was a Canadian. The parents of Justin Morgan, Figure’s owner, lived in Quebec, where he often visited. Once Morgans became popular, many a Quebecer drove teams of Canadians over the border and sold them as Morgans, making a nice profit. George Barnard Sherbrooke, L.C., wrote an article published in "The Cultivator", vol. 9, p.33, 1842, in which he discussed the qualities of the Canadian (or French-Canadian Horse, as it was then known). "The broad, courageous looking head, with the ears far apart, thick neck, general stoutness of frame, full breast and strong shoulder, with a round or fleshy croup; the low set muscles and large sinews, with those tough feet, that know not disease, are distinguishing marks of the French Canadian horse," he said. Sherbrooke noted that there were differences between the Morgan and the Canadian, and this was one of the most notable: "The Morgan appears to be subject, as much as equally strong constitutioned horses of any breed, to founder and other diseases of the feet, while with the Canadian such ailments are less known, perhaps, than with any other breed in the world. There are numbers of horses in Canada that, under a mass of shaggy hair, possess dry, sinewy legs, on which the severest service never raises a wind-gall." Despite the differences between the two breeds, he found it hard to find any other breed besides the Canadian which could have been the foundation for the Morgan. "The high crested neck and thick, wavy tail of the Morgan, show much of the character of some races of the Canadian, " he said. "If the French Canadian did not supply the Morgan, I, for one, should be glad to learn what other breed has ever been known upon this continent that could boast such excellent qualities for common service as are universally admitted to distinguish both of these breeds." Canadians are found in the early pedigrees of many gaited American breeds, most notably the Missouri Fox Trotter, Tennessee Walking Horse and American Saddle Horse. America’s once-famous Conestoga Horse breed no longer exists and its history is unknown, but the only remaining drawing of one shows a remarkable resemblance to the French-Canadian horses. So how did such a useful breed nearly disappear? The answer is threefold: exports, war and mechanization. Because they were so useful, many Canadian Horses were sold south. Since they were very fertile, genetically healthy and easy to breed, it seemed that there would always be an unlimited supply. Americans knew that the little Canadians made excellent cavalry mounts, having been used as such by the French and British in Canada for two centuries. Thousands were sold to the United States during the Civil War, where many succumbed to war wounds and disease. Outside of Quebec, the Canadian was interbred with other breeds and forgotten. In 1885, nine years before the Morgan registry was created, some worried Quebec breeders formed an official Canadian Horse registry to save the breed from disappearing. Many horses were examined. Many were rejected for not being of correct type, for having undesirable cross-breeding or for being unsound. Only healthy, typey horses were registered. By coincidence, no greys were found that met the criteria for registration, and as a result that colour no longer exists in the breed. In 1909, a new stud book was created. Unfortunately, horses outside of parts of Ontario and Quebec did not get examined and were left out of the stud book, an oversight that finally would be corrected with the examination and registration of additional purebreds in 1950. In 1912, the Canadian government began a breeding program in Quebec to help preserve the Canadian Horse, since it was perfectly adapted to the climate and to the needs of the country. When the Boer Wars began in South Africa at the beginning of the twentieth century. Canada sent troops and Canadian Horses to support Britain. Just a few years after the government breeding program began, hundreds more Canadian Horses were shipped overseas during World War I. At that time, no one realized what an impact mechanization would have on Canadian society. No one dreamed that the day would ever come when horses were no longer needed for farming, transportation and as cavalry mounts. It was unimaginable. But that day came. When automobiles took over the roads and tractors and farm machinery replaced horses, Canadian Horses lost their jobs. By 1940, the government breeding program, which had been concentrated on increasing the average height of the breed, was greatly reduced. Fortunately, private breeders took advantage of the opportunity to buy up many of the little, traditional Canadian Horses that the government had decided were too small. This helped to keep the original breed alive and also preserved the old bloodlines. The last federal stud farm lingered on until 1981, when the remaining forty-four government-owned Canadian Horses were auctioned to members of the Canadian Horse Breeders Association. Fortunately, increased use of horses for sporting competitions and pleasure created a new niche for the breed. Frank Prosperine made the horse world take notice of the Canadian when he won the North American Pleasure Driving Championship in 1987 with his team of black Canadians. Afterward, the breed began increasing in popularity and no longer is on the edge of extinction. In 1990, two Canadian Horses accompanied the POLARLYS Expedition to Cornwallis Island, spending eight weeks in the far north. Since then, the Canadian has been showcased in the Battle of the Breeds at the prestigious Spruce Meadows horse shows in Calgary, Alberta, impressing an international audience with their versatility, good temperament, beauty and never-quit attitude. In 2009, two Canadian Horses were ridden and led from Quebec to Texas A&M University, stopping at the Kentucky Horse Park along the way. Accompanied by his wife, filmmaker Louise Leroux, Rick Blackburn rode one horse and led the other as a pack horse throughout the 2,500-mile trek. They carried 50 DNA samples from Canadian Horses to the university for analysis and comparison with other horse breeds by Dr. Gus Cothran. Both horses arrived in great condition, despite not being inside a trailer for the entire trip. From critically low numbers in the 1970s, the Canadian Horse has rebounded well, due in part to its excellent genetic health. Although the numbers are still not high, there are now around 5,000 registered Canadians, enough to sustain the breed. In appearance, the breed has changed little, retaining its sturdy build, thick wavy mane and tail, little ears, neat head, arched neck and strong bones and hoofs. The good temperament has remained unchanged and its work ethic is as strong as ever. Today's Canadians are used on farms and as pleasure mounts. They are ideal for logging in areas unsuitable for machinery or larger horses. They compete in dressage, jumping, harness, competitive driving, western events and as children's mounts. The headstudy photo at the top of the page is South Forty Prince Fonzie, owned by Cherry Creek Canadians. He is an excellent representative of the fantastic temperament, trainability and versatility of the Canadian Horse. The Canadian is still the little horse that can do it all and do it well. Old paintings bu Kreighoff and Eerelman portrayed buckskin Canadian Horses, but the cream dilution gene that causes buckskin and Palomino seemed to have vanished from the breed. However, it recently showed up again when a light Palomino stallion was sired by the black stallion Jonathon Coco Pharraud (1982-2011). Overall, Pharraud sired five Palominos. Two are registered as "champagne" but are clearly Palomino, two were registered as "white" (both are light Palomino) and the fifth was registered as Palomino. Apparently the gene was carried through a line of blacks for generations before it surfaced again. These horse have themselves produced several more Palominos, bringing back an old colour not seen in a very long time. A Canadian horse named LDR Remi Kowboy is a retired Calgary Police Service mount. The CPS now has four Canadian Horses in its mounted patrol. All Canadian Horses today must be DNA tested for purity and to show that the parentage is correct before they can be registered. There are eight different families, or sire lines, in the Canadian Horse, each with its own distinctive characteristics. One of these lines, from the red chestnut stallion Brio de la Victoire (foaled in 1958), descends through his only son, La Gorgendiere Brio Alto. Alto sired just two sons, and only one of them left offspring: La Gorgendiere Alto Fox. Today, the "Fox" line from Brio is the most common one in the breed. Canadian Horses today are named in a special way. The first part is the registered herd name (or stable name) for the breeder, the second is the sire's individual name, and the third is the horse's individual name, which begins with a designated letter according to the year of birth. Thus, one can see at a glance the name of the sire, and know from the letter of the name what year the horse was born. All registered Canadian Horses can be found in the on-line Electronic Herdbook which is a database kept by the Canadian Livestock Records Corporation. Canada Post featured the Canadian Horse on a stamp and First Day Cover envelope in 2009. There are only a few books about this breed, and even most horse encyclopedia don't include Canadians, but here are some that I found informative. The first book about the breed is The Canadian Horse: A Pictorial History by Gladys Mackey Beattie. It is out of print, but it is occasionally available from book sellers or on eBay. It was first published in 1981 and reprinted in paperback in 1999. The Draft Horse Connection has a video about the Canadian Horse which can be purchased. What a beautiful horse. I love horses. Very interesting to read and learn about the history of this horse. I am pleased that numbers are high enough now to sustain the breed. Very good! Really enjoyed it!